Knowing that we're talking about the GAL and/or OAB at this point, I went to rebuild the OAB ahead of schedule. But the OAB fired back, "I can't generate!" It was configured to generate in public folders and for web-based distribution. Doing some thinking, I jumped into ADSIEdit and discovered that my public folder hierarchy was still pointing at the legacy server in the Exchange administrative group. What's interesting is that the OAB generation was occurring on my new server and was targeting the public folders database on the new server. So what's wrong with this picture? Sure enough, my legacy server isn't in the DN, but I wasn't like I could turn it back on. The object was deleted from the Exchange administrative group and the physical hardware had been sent to the dump months ago. 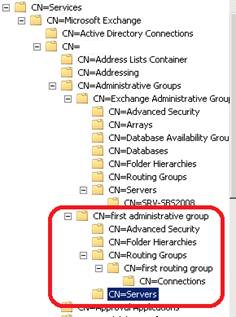 Looking at the Folder Hierarchies in both administrative groups revealed that the hierarchy object was in the old administrative group, but not on the new one. That's right a server that didn't existing anymore was responsible for maintaining the MAPI PF tree for my new Exchange server. Once that's in place and I've confirmed I'm not getting NDR's things look great. Oh wait, Message Tracking shows that my message is received but never hits the mailbox store. A glance at the Queues, and my message is in the Unroutable Queue. Remember our screenshot above? There's still a routing group connector on the legacy administrative group side, but not on the production site. Yes, that'll be a delete in ADSIEdit. You backed up all of this first, right? And with that, upgrading the GALs to the new 2010 format and an OAB update and I can finally use mail-enabled public folders in Exchange 2010. Remember, your mileage may vary! Backups are important, to the point of considering PST exports of the Public Folders as an additional failback. The best part is, this is documented, but there are several pieces we had to put together, but with a good understanding of the schema and using ADSIEdit and the issue became obvious and we had a path to resolution.